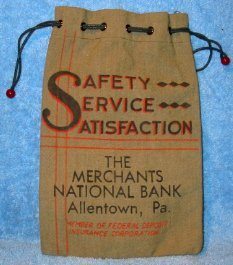 Bank Cash Bag – Old canvas cash bag from defunct Merchants National Bank of Allentow, PA. Measures 6 1/4 x 9 1/4 inches flat. Unused great shape.